3:14 “Record the descendents of Levi by ancestral house and by clan…” This is counting for a different reason. But why the reference to one month before a child is counted? PG: This may be a reference to the taking of the first born. Prior to one month you may not have a viable human being with a chance of living to adulthood. See footnote re no funeral or mourning practices being followed. The “counting” here is really an identification of names; an accumulation of information rather than merely a number. We need to know who the individuals are who will be carrying out certain sacred functions. At the heart of the issue is the meaning of the Hebrew word eleph. It is usually translated “thousand,” but has a complex semantic history. The word is etymologically connected with “head of cattle,” like the letter aleph, implying that the term was originally applied to the village or population unit in a pastoral-agricultural society. From that it came to mean the quota supplied by one village or “clan” (Hebrew Mišpāḥā ) for the military muster (Malamat 1967: 135). Originally the contingent was quite small, five to fourteen men in the quota lists of Numbers 1 and 26, as shown by Mendenhall (1958). Finally the word became a technical term for a military unit of considerable size, which together with the use of the same word for the number 1,000 has tended to obscure its broader semantic range. 3:27 Now we have a group of 8,600 but we are again dependent on translation here. This could also be descriptive of military units. In Leviticus there is a very clear sense of a particular priestly class – that you are born into. The Deuteronomist notion is far less family based and more function based. One can become a keeper of the sacred by opting to do so and being trained. The difference is between egalitarianism – which is far less socially stable – and anti-egalitarianism. But in the long run the establishment of a hereditary priesthood can prove disastrous for a society. (LL: As it eventually did for the Jewis.) For an understanding of some of the problems associated with translating numbers see: And God Said by Dr. Joel M. Hoffman at pages 87-89. 3:38 “…any outsider who encroached was to be put to death.” This is a great cone of protection around the tabernacle. 3:40 -44 Record every first born male. The concept of redemption money. But note that a shekel is a weight and could be in grain – there is no specific reference to coins here. LL: It is interesting here that the word “redemption’ here seems to mean simply to “buy back” rather than the more fraught sense of the word used elsewhere as atoning for sins. 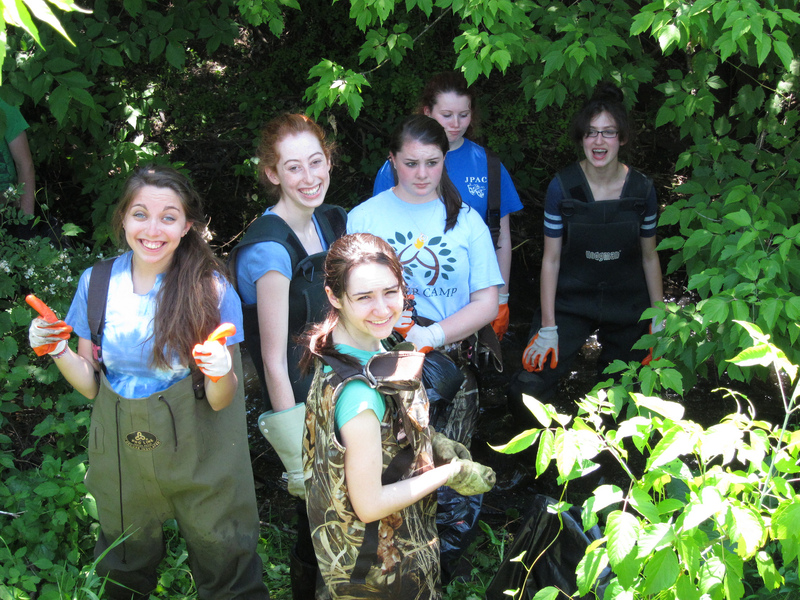 The Vassar Temple Youth Group helped clean up a local stream as part of a community-wide Mitzvah Day. Among the objects they retrieved from the water were a bicycle and a bowling ball. Other projects included helping local not-for-profits, collecting food for the hungry, and organizing a recycling drive. 26:18 Blessings and curses. These are the curses. This is all metaphorical and very poetic. …I will smite you sevenfold for your sins… But what is the metaphor? AF: God has shown that he is capable of plagues so these are credible threats. PG: Many of these phrases are also found in the prophets. God can build and destroy. Prayer is filled with both blessings and warnings. But what gives rise to these punishments? Failure to believe in one God? There is an over-arching theme here – it is social injustice. You are causing the disorganization of society by failing to adhere to the law and maintain a social and civil society. The tendency is to think of these passages as supernatural and accordingly to be ignored. This is not primitive nonsense – the reason for laws is the maintenance of a just society. This is a reminder of the consequence of ignoring laws – social failure and anarchy. The orthodox view in most biblical faiths is one of crime and punishment – taking the text on the surface. Remember that God disappears from the Torah with Elijah – the still small voice story. The exception is in the Book of Job which is likely pre-Elijah. In the final story of the Bible – the Book of Esther – there is no mention of God. Finally, we must each take personal responsibility – not only for our actions but also for the well-being of others. DC: The Orthodox go to their Rebbe for answers. This is the abdication of personal responsibility. PG: We give up our freedom in some areas in order to be free to be free in other areas. AF: Does this mean that everyone has to obey or all will be punished? PG: This is the debate between God and Abraham in Sodom and Gomorrah. The fact is that a small group can cause the destruction of everyone – unless we are alert to taking responsibility even for those who violate the law. This is designed to be liturgical – call and response – instructive. The original intent of individual authors here is not important. It is the editor or redactor who has brilliantly assembled these writing in such a way as to establish a blueprint for a just government. LL: I am constantly amazed at the profound insights into human nature that these redactors have displayed. They know that poetry is the best teacher; that lessons must be embedded in metaphor in order to be lasting. 26:27 Very graphic curses. Consider the bumper sticker “I am spending my children’s inheritance.” AF: The writer is putting a repugnant description into the mind of the reader – it is hyperbolic language that will be remembered. 26:31 Even your connection to God will be severed. See Note 30 and reference to translation by Hoffmann. Note that the people accept Moses authority to speak to God but all of the Prophets are challenged on that point. Now we have had 3200 years without receipt of a direct message from God. The writers of this text were well aware of the gap in their own time. What did they – and what do we – make of that? We cannot expect supernatural intervention. We must live within the pragmatic boundaries of a just society. There must be a benefit to being “good” beyond just doing what God has told us. This is a description of the scheduling of important holidays in the Jewish calendar. 23:23 On the first day of the 7th month – a day of rest – a sacred day (New Year) commemorated with loud blasts – the announcing of holiness. The Hebrew is a series of nouns that can be assembled in a variety of ways. Why are we commemorating the sacred occasion with loud blasts? This is a form of remembrance – ala the tolling of bells or a twenty one gun salute. There are five festivals – why is this one announced in this manner – is it a measure of importance? The seventh month is in the fall in which the world appears to “die”. This is the period of time when we remember those who have passed away. AF: How is this applicable to the rest of the world? How would a Jewish Eskimo celebrate the harvest? PG: The distinction between the seasons in the eastern Mediterranean is rain or no rain. We really don’t know how the calendar worked in biblical times. Some contend that the day started at sunset not sunrise. This was a point of contention between the Sadducees and the Pharisees. The reference is to a new moon – which would have been identified by the priests. See the work of Solomon Zeitlin: http://en.wikipedia.org/wiki/Solomon_Zeitlin He takes the position that years were established to be 360? days long so the first day would always be a Sunday and the last a Saturday – every year. This causes “draft” and the lost of days. To compensate the priests established the creation of a fifty day year – the Jubilee year. The control of time has political as well as sacred elements. It is a statement of who is in control. When it comes to Shabbat everyone can identify the day by counting days seven days. Here the priests tracked the months – not the ordinary person. DC: Isn’t this being set up so as to identify Yom Kippur as the holiest day of the year? PG: There is no parliament of holiness here. 23:26 The tenth day of the seventh month. Here the Day of Atonement is identified – plus the penalties for violation. Yom Kippur begins before the sun sets. Compare the instruction of God to Moses in Exodus 12. This is all in preparation for Succoth. There are hints in the text as to the changes that can be made as Jews are scattered throughout the world. Memory is how we create immortality. But what makes one worthy of being remembered? That is the self examination of the tenth day. This is the most deeply theological moment of the year. There is a disconnection from the harvest that can be observed by Jews in Alaska. LL: Sadly, history remembers the unjust as well as the just or the wise. 23:33 On the 15th day of the 7th month – the feast of booths. This is the principal harvest festival. What is the connection of the 10th for the harvest. What is the relation between the introspection of Yom Kippuir and the harvest celebrated at Sukkoth? In any given year the yield of the harvest will change – it is out of the hands of the farmer and in the hands of God. On the 10th day we are preparing ourselves mentally for what will be the result of the year’s labor. DC: Is this like the sequence of confession and communion? LL: An interesting analogy but it doesn’t entirely fit. PG: The harvest is such a big deal that we will celebrate it for eight days! SF: The key word in 23:26 is “expiation” We have to purge ourselves from guilt – emotionally – in a deep biological way – so that we are prepared to be grateful. PG: And also prepare ourselves to be just. The key to Succoth is in Deuteronomy “You shall feel nothing but joy.” This is whether the harvest is good or bad. What could Succoth mean while in exile – or when Jews do not own land? The Babylonian exile and Diaspora call for a theological explanation that can be understood not only by the landless Jew but also the modern Jew who feels little or no connection to the harvest. See: The Festival Calendar (23:1 – 44) in Gleanings on p. 833 of Plaut. 19:15 “You shall not render an unfair decision…” This is structured almost as a call and response – which raises interesting theological issues as to what “I as the Eternal” means at the end of each line. Is this a diktat? There is potential conflict with democracy where there is strict divine authority. Have we moved from the unchallenged power of pharaoh to the unchallenged power of God? This would suggest that the High Priest – channeling God – makes the decisions. DC: This is an establishment of standards – guidelines. AF: This is socialism. PG: And a kibbutz is communism – neither system precludes democracy. The only question is how government is shaped so as to avoid decay and corruption– such as occurred in the Soviet system. 19:19 No mixture of cattle, cloth or seed. PG: What comes to mind as to the controlling law here is the sequel to creation. “You shall observe my laws…” includes the physics of the universe – one must obey the law of gravity by proceeding prudently. Creation was compartmentalized day by day. This is a continuation of that compartmentalization. The suggestion is that we should not attempt to be god-like. AF: Is the creation out of nothing? PG: Maimonides argued that this could be accepted only as a matter of faith. The text is ambiguous. His position was challenged by the literalists. AF: What if a blind man pokes out someone’s eye? PG: Exactly, the lex talionis has many failings. 19;23 Harvest no fruit in the first three years. This may be a reflection of cultivation practices – allowing the fruit to be used to nourish the tree itself. See footnote on advantages of this technique. CL: The biblical references to slaves were quoted as justification for slavery in the 19th C. PG: Alfred Kazin – the literary critic – noted that there were 24 nations that had freed their slaves in that time period. Twenty three of them did it peacefully. The 19th C. was a very religious time in the U.S. The collapse of the cotton trade in the U. S. resulted in the growth of that trade in the middle east – and the subsequent success of Zionism.